Physitrack offers clinical groups powerful and easy-to-use tools that uniquely enable the automated collection, aggregation and analysis of key data from patients in a clinical ecosystem. 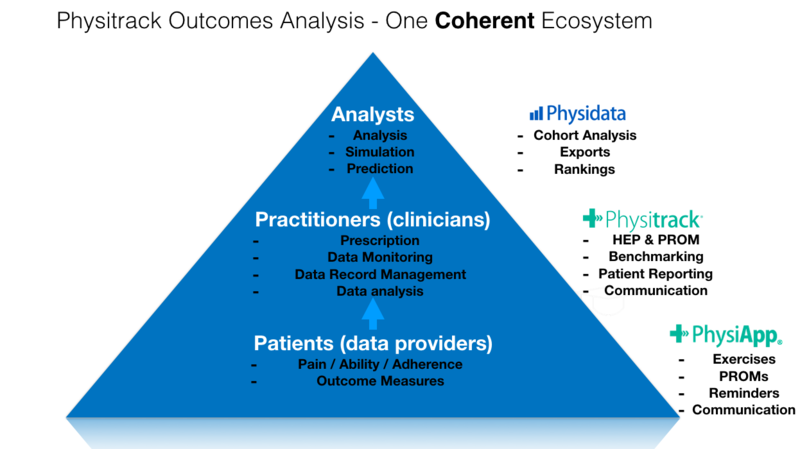 Build a proprietary outcomes database, powered by automated, easy-to-use tools that are contained within the day-to-day tools of the healthcare practitioner rather than in a separate system or application. Provide patients with data reporting tools that are contained within PhysiApp, the single point of contact for anything related to the patient journey, rather than a separate system or application. Draw wider conclusions about patient outcomes and digital culture with easy-to-use, on-screen tools built into day-to-day clinical tools rather than contained in a separate system or application. Establish methodology and workflow for pay-for-outcomes-based payer relationships. Streamline the archiving and delivery of outcomes data for payers and regulators. The tools, which are seamlessly integrated into Physitrack’s patient, practitioner and administrator tools, are available as subscription services for an up-front enablement fee and an additional subscription fee that covers maintenance and specialist support. Contact sales@physidata.com for more information.